The restaurant scene in Lisbon is getting more interesting and exciting year by year. The best chefs offer Portuguese interpretations of the innovative techniques and ingredient combinations that are shared by top restaurants throughout Europe and North America. Asian influences also are becoming stronger in Portugal. 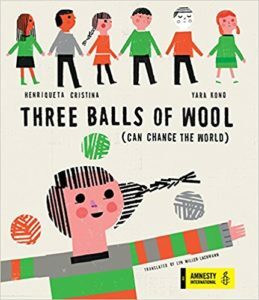 This country both benefits from and contributes to the international flow of ideas about cooking. What follows are my evaluations of the places where we ate during our months of living in Lisbon in 2012, 2014, 2015, 2016 and 2017 grouped into categories. We have made return visits to many over the years, but where we didn’t return to ones we found disappointing, we have dropped the descriptions from the list but link to the original reviews. All the restaurants listed are in business as of June 2017. I hope you will find this helpful if you travel to Lisbon, and that you will add your impressions of these and other Lisbon eateries in the comment section. When we return to Lisbon we will try your suggestions and incorporate them into the next edition of this listing. The growing empire of Chef Kiko. Next year, we’ll have to try O Watt, which opened a week after we left. Belcanto (Largo de São Carlos 10; phone 213-420-607). This is Lisbon’s most interesting and successful effort at molecular cuisine, making use of first class ingredients. Chef Jose Avillez richly deserves his two Michelin stars. The menu is frequently updated, reflecting Avillez’s continuing experimentation. 100 Maneiras (café at: Largo da Trindade 9; restaurant at: Rua do Teixeira 35; phone for both: 910-307-575 http://100maneiras.com). They have both a café and a restaurant with a single tasting menu. The restaurant’s tasting menu at 60 euros is a bargain for a meal of this quality. The dishes are inventive and use top quality ingredients. We were especially impressed with a cuttlefish cappuccino and a flash fried prawn with a delicate curry sauce. They are highly skilled in their use of foams and combinations of multiple sauces in a single dish. The wine tasting of entirely Portuguese wines offered with the meal is reasonably priced at 30 euros. The service is highly professional and friendly at the same time. The café menu has an excellent variety of interesting dishes, well prepared. Their tartares and fish and seafood capriccios are excellent. In addition to their regular menu, they have delicious specials, some of which make good use of various seaweeds for broths or as accompaniments to fish. However, the café has recently raised its prices and is not the value it used to be. Mini Bar (Rua Antonio Maria Cardoso 58; phone 211-305-393). Another restaurant from José Avillez, and besides Belcanto his best in Lisbon. He offers 39 and 48 euro tasting menus, but there also is a fabulous a la carte selection too. The prices are a bargain for cooking with this level of technical sophistication. This restaurant is a way to taste Avillez’s molecular dishes without committing to the set multi-course tasting menu, currently 125 euros, at Belcanto. Minibar offers some of his classics, like his exploding olives, along with new dishes. I was especially impressed with his “Ferrero Roche,” small bites that look like the candy but instead are a flavorful liver mousse surrounded by nuts, a low temperature poached egg with parmesan, prawns with a ceviche-style sauce, and wonderful barely cooked scallops with Thai seasonings. There also are excellent meat dishes, and fun desserts. The wine selection is very good and well priced, and they offer innovative cocktails. Casa de Pasto (Rua de São Paulo, 20; phone: 213-471-397). Interesting takes on traditional Portuguese food. Their razor clam soup is wonderful and other dishes were delightful and tasty. Prices are a steal for food of this quality. Their 25 euro tasting menu is an amazing bargain and unlike most such multicourse meals the portions are modest enough that you leave feeling satisfied rather than full to bursting. They showcase excellent wines from new Portuguese producers and have opened a wine bar on the ground floor with a small but well-chosen selection of Portuguese wines, available both for drinking their and at their outside tables and to take away; the restaurant is one flight up. Their plans to create a boutique hotel on the upper floors have still not been realized as of 2017. Service is friendly and professional, and the restaurant has a hip design, with perhaps the most fanciful looking bathrooms I’ve seen in a restaurant anywhere in the world. Hipster and Trendsetter approve. A Cevicheria (Rua dom Pedro V 129; phone 218-038-815). Excellent super fresh fish and seafood is used to make ceviche with combinations that are interesting, tasty and different from the standards found in many cities around the world. Their prawn gazpacho with tapioca is a great starter. I especially was impressed by a dish called Sea Quinoto in which quinoa that is deeply flavored with seafood broth is combined with various shellfish. The chef, Kiko Martins, also at times makes off-the-menu specials. I especially enjoyed a plain whitefish ceviche enlivened with chestnut cream and a powerful truffle oil. Note: A Cevicheria does not take reservations and there can be long waits at dinnertime and on weekends. O Asiático (Rua da Rosa 317; phone: 211-319-369). 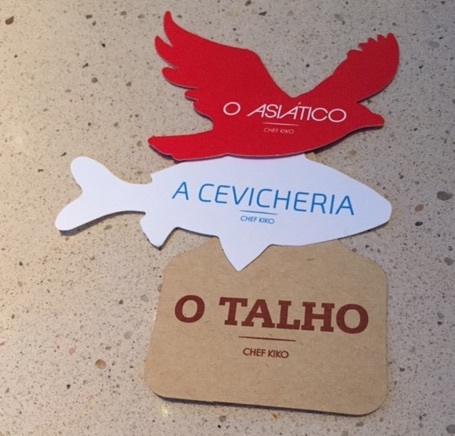 From Kiko Martins, the same chef as A Cevicheria, this is an outstanding addition to Lisbon’s restaurant scene. The setting is beautiful, with garden seating as well. On our visits there, we loved the Pani Puri (thin, light crusts surrounding salmon tartare with tamarind), an amazing raw scallop appetizer in a bracing complex broth, two different ceviches – a Thai and a Laotian – a tasty barbeque octopus with a mix of vegetables in a fusion Chinese-Portuguese sauce, and a deeply flavorful cooked turbot with bits of pork belly skin, seaweed and thin strings of calamari and tiny bivalves in another wonderful sauce. Service is attentive and professional. Cantinho do Avillez (Rua dos Duques de Braganca 7; phone: 351-211-992-369). An informal restaurant from José Avillez, the chef of the wonderful Belcanto. The menu is meat-heavy with renowned steak sandwiches, but the appetizers and fish dishes are especially good. Bairro do Avillez (Rua Nova da Trindade, 18; phone: 351-215-830-290). The newest José Avillez restaurant and his most informal and least impressive. Platters of charcuterie and cheeses are of high quality though unoriginal. You can get Avillez’s famous and unique exploding olives. A mini-cone of spicy horse mackerel sushi was, by far, the best dish here and up to Avillez’s high standards. Most other dishes are good, but nothing special. Grilled lettuce and a dish of grilled asparagus and mushrooms were worthy vegetarian options. Octopus with kimchi came in a pool of oil and had no trace of kimchi. The steak sandwich here was mediocre, several notches below the one at Cantinho do Avillez. Gastro Bar by Eleven (Rua da Misericordia 78; phone 919-835-036). A stylish bar with unique and unusual cocktails and a small but delicious menu. Their egg yolk ravioli with creamy mushrooms, nori seaweed and truffle oil is addictive. Shrimp gratin gnocchi were excellent and a cold cantaloupe soup with shrimp and mint was tasty. A creamy corn porridge with clams and coriander was bland. They also have a ceviche and various meat dishes. Their desserts are nice but nothing special. Prices are somewhat higher than comparable Lisbon restaurants. Service is very friendly. Cafe Lisboa. Largo de S. Carlos, nº23; phone: 211 914 498) A bistro with Portuguese influence from José Avillez, the chef of the wonderful Belcanto. The café has a room inside the theater and also tables in the plaza in front of the Sao Carlos Theater, a beautiful setting for tasty food. Tágide Restaurant and Wine and Tapas Bar (Largo da Academia Nacional de Belas Artes 18 and 20, Chiado; phone 213-404-010, restaurantetagide.com; closed Sundays. This restaurant has beautiful views of the river, the Cathedral, and Castelo St. Jorge. The restaurant is an elegant setting. Their soups and appetizers are especially good; the main courses are fine but less inspired. Their lobster bisque is wonderfully tasty and aromatic, and the broth that accompanies their clam appetizer is one of the most flavorful I have had anywhere in the world. The Wine and Tapas Bar also has good dishes: the tapas are excellent. Soups are wonderful, and I especially enjoyed their Mozambique Tiger Prawns with seafood and herbs ‘Açorda’. The selection of wines in both the restaurant and tapas bar is very good. Be aware, the tapas bar is very noisy in the evening but much quieter for lunch. Decadente (Rua de São Pedro de Alcantara 81, Bairro Alto, phone 213-461-381, theindependente.pt). Pharmacia (rua Marechal Saldanha 1; phone 213 462 146). 1300 Taverna (Rua Rodrigues de Faria 103; phone 213-649-170) Located in LX Factory, a fun complex of stores and restaurants. Beautiful décor but mediocre food. A better and much less expensive choice in LX Factory is Malaca Too (phone 967-104-142) with a Pan-Asian menu. Their curries are especially good. Taberna da Rua das Flores (Rua das Flores 103) is a pleasant, well-located restaurant that specialized in fresh fish. The dishes are mainly traditional and simply prepared. Note that this restaurant does not take reservations and only accepts cash. Time Out Mercado da Ribeira (Avenida 24 de Julho, Cais do Sodré). Half of the building housing the old food market remains a series of stalls with fish, meat, produce and flowers open only in daytime. The other half has been turned into a market with stands from a variety of Lisbon restaurateurs. Some are famous and mediocre such as the steaks and steak sandwiches at Café de Sao Bento and the ice cream of Santini. Others are very good: the black (squid ink) rice with scallops and seaweed of Alexandre Silve, the fish carpaccio of Henrique sa Passoa, and the tartars, both fish and meat, at Tartar-Ia. (The wonderful fish soup of Cozinha da Felicidade went off the menu in May 2016 and still has not returned a year later). The small dishes of Marlene Vieira are good but not great. There also are stands where you can get cheeses, cured meats, cookies, chocolates and more to eat there or to go. In any case, it is a fun experience to see and taste multiple small dishes and to see the crowds of happy local and foreign eaters and drinkers. At the most crowded times it can be difficult to find a seat and too many of the patrons hog seats or hold them for friends arriving later. The stands then are overwhelmed and it can take 20+ minutes to get your food and sometimes the preparation is rushed and sloppy. For example, the peixinos (Portuguese tempura) at Marlene Vieira were overly doughy and therefore almost tasteless. The market is open 7 days a week: from 10am to midnight (Sunday to Wednesday), and 10am to 2am (Thursday to Saturday). Palácio Chiado (Rua Alecrim 70; 351-21-010-1184) palaciochiado.pt. noon to midnight 7 days. This new addition to the Lisbon dining scene is set in a beautiful rehabilitated eighteenth century palace. There are mini restaurants from which you order and the food is delivered to your table in the central hall with a beautiful bar that has a good selection of wines, beers, and cocktails. None of the food is groundbreaking, but most of it is very good. The meat counter has beautiful beef and I enjoyed an excellent tartare. The fish section has fresh oysters and various prepared dishes. There is a codfish section with the usual old style dishes, boring but well prepared. In a nod to the new US fad there is a poke stand, with an especially good vegetarian poke along with fish ones. The ice-cream stand is very good. Upstairs are two sit-down restaurants: one for cheese and charcuterie and the other for sushi. The former is standard and good; the latter has some interesting Portuguese twists on sushi. 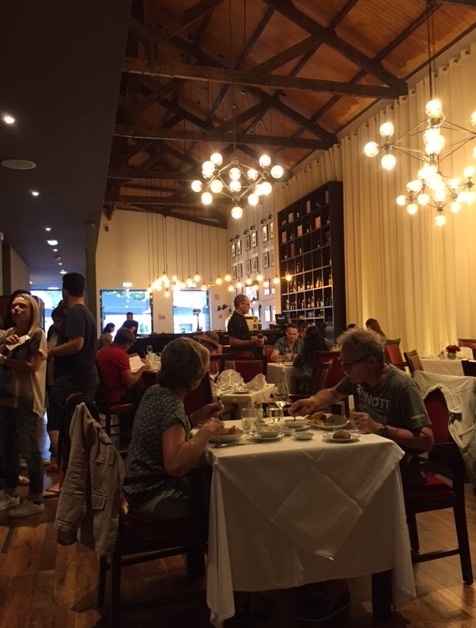 Tapisco (Rua D. Pedro V, 81; phone 213-420-681) is in an elegant room but the food, even though the menu was developed by local celebrity chef Henrique Sá Pessoa, is mediocre at best. What the menu called grilled vegetables with romesco sauce were boiled vegetables. The batatas bravas were covered with what tasted like bottled barbeque sauce from an American supermarket. Fried cuttlefish were bland but at least not overcooked. Preserved fish roe with a pepper vinaigrette sauce was ok. This restaurant cannot be recommended unless you want to know what the food at a Spanish summer camp might taste like. Absurdo by Olivier (Avenida Ribeira das Naus 16; phone 213-420-369) makes unusual sandwiches with vegetables and a delicious cheese spread. Their soft rolls are tasty. Most sandwiches are with meat or fish, and one is all vegetarian. Their namesake sandwich has 42 ingredients and if you can check off the exact ones from a list you will get your name on their wall of fame. The sandwiches are American-sized and 9 to 11 euros each. Zaafran (Largo Dona Estefânia, nº7; Metro Picoas; phone 213-558-894). Closed Sundays. This would be a top Indian restaurant in any US or European city, and well-regarded in London. The owners are Indians who lived in Mozambique, and there are subtle African elements in some of the dishes. Be aware: Thursday nights they have belly dancing and a set menu. Delicias de Goa (Rua Conde Redondo, 2a; phone 961-491-521). Goa was Portugal’s colony in India and this restaurant presents delicious renditions of Goan dishes, featuring extremely fresh seafood. Goan spices are somewhat different from those you will find in most Indian restaurants in the US or Europe, so this is an opportunity to taste dishes that are hard to find beyond Goa. Note: this restaurant does not accept credit cards; you must pay in cash. Lapa Restaurant (in Lapa Palace hotel, Rua Pau da Bandeira 4; phone 213-949-494). Pizzaria Lisboa (Rua dos Duques de Braganca 5H; 1200-162 Lisboa; phone 351-211-554-945). A pizza restaurant from star chef José Avillez. The best pizza I’ve found in Lisbon. The crusts are good but not outstanding, but the toppings are varied and excellent. There are more than twenty choices. I especially liked the one topped with truffled mortadella and the mushroom. Casanova (Av. Infante D. Henrique 7 Loja B; phone 218-877-532) good pizza. This place is very popular and most evening there is a line, but the many tables and fast service usually keeps waits to under 30 minutes. Cais da Pedra (Av. Infante Dom Henrique, Cais da Pedra. Armazem B, Loja 9; phone 932-561-522). The gourmet hamburger craze has hit Lisbon. This is a worthy entry, with a variety of toppings and relishes, an excellent veggie burger, and large portions for the price. A beautiful riverside location. O Prego da Peixaria has four locations in Lisbon, including Rua da Escola Politecnica 40. Their fish and seafood burgers are very good. We specially liked the salmon with squid and seaweed and the shrimp. They also serve beef burgers. Their appetizers were almost tasteless. Innovative sorbet shop Sorbettino still had the new-store smell. Nannarella (Rua Nova da Piedade 68; phone 916-302-201; open noon to 7:30 pm every day except Sunday). The best ice cream in Lisbon. Their chocolate ice cream is outstanding, rich with just the right touch of bitterness to cut the heavy creaminess. The cream overwhelms the fruit flavors, but mint, amaretto, and other non-fruit flavors and sorbets are excellent. Sorbettino (Rua da Mesericordia 23) This new addition to Lisbon opened in May 2017. They make only sorbets, no ice cream. Their sorbets are world class, as good as Nannarella’s. The fruit flavors are not overly sweet and have powerful fruit flavor. Their dark chocolate sorbet is fabulous. 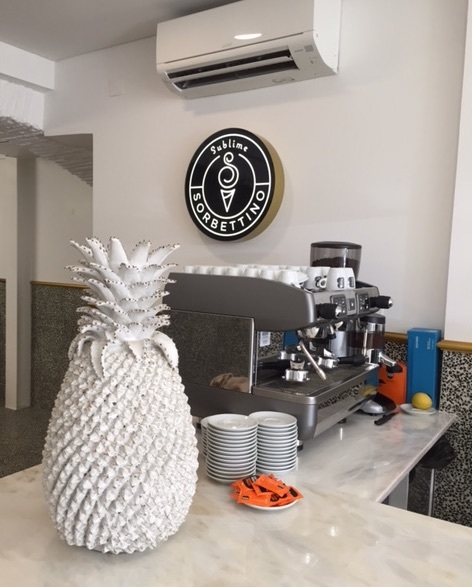 Gelato Davvero (Praca de San Paulo 1; phone: 929-165-208). An extensive selection of flavors, including unusual ones like wasabi. The texture is excellent and the quality of the flavors is very good, almost as good as Artisani, but with more choices, though not at the level of Nannarella. Fragoleto (Rua da Prata 61; phone: 213-479-472; open noon to 8 pm daily). Numerous flavors with original combinations, all made with organic ingredients only. Unfortunately, the flavors often are weak. Quality is less than Nannarella or the multi-location Artisani. Santini (various locations in Lisbon). This is the well-known, tourist-clogged ice cream place. They are good but their ice cream is clearly several notches below Nannarella and Artisani, and their sorbets seem to decline significantly in quality year by year. Mu (Rua Dom Pedro V #1 and Campo Marties d Latria #50). Mu has improved its offerings by hiring a new ice cream maker. They now are on the level of Santini. Their most interesting flavor is kiwi-banana. Nata: the best Pastel de Nata is from a store simply named Nata. Currently they have 2 Lisbon locations: Rua de StªCruz do Castelo, 5 a 11 and Rua da Prata, 78, as well as locations in Cascais, Porto, Braga, Coimbra and elsewhere in Western Europe and in the United Arab Emirates. They also serve soups, salads and sandwiches, which makes Nata a reasonably priced and reliable lunch spot. Tartine (Rua Serpa Pinto 15A) is a good, but not great, French bakery. Alcoa, which opened in 2017 (Rua Garrett 37), has French and Portuguese pastries and like Tartine is good but not outstanding. The inside of Faro standout Faz Gostos. Faz Gostos (Rua do Castelo 13; phone 289-878-422) is the only Michelin listed (not starred) restaurant in Faro. There are others in the Algarve, including two 2-star entries. Faz Gostos is in a beautiful space in the old town. Fresh fish is not overcooked and the sauces are decent. This is not a destination restaurant, but if you are in Faro this is the best you will find. De Castro was a less formal, but I think more interesting, restaurant from the chef of Largo. They served outstanding fresh seafood and fish, innovative dishes, including de Castro’s renowned clams with butter beans. The restaurant was on the pretty Praça das Flores in the Principe Real neighborhood.